In reading several books about the archaeological finds of the recent century, I fully expected to come across much duplication of items and related text on the importance or impact of such finds. However, this book introduces finds that I had not encountered in other books, and that is most likely because the author is an archaeologist and professor of Biblical Archaeology. His reports within this text contain his personal discoveries with pictures and anecdotes of the dig. Once Price relates his adventures with other research and its secular bent compared to his perspective, the remainder of the book gets down to the basics of what he has discovered. This books covers a large section from chapters 9-11 on the Temple Mount and interestingly, new evidence not in other books I have read is given, such as the exact excavation of the Broad Wall and the Israelite Tower. 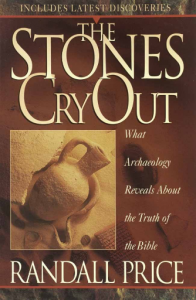 The chapter on Kings and Prophets (12) details the most of the small finds, such as the Bulla of Baruch, Jeremiah’s scribe, the coins, jewelry, the irons implements used in battle, pottery, and even oil lamps. One new discovery and its biblical enigma I had not come across in other texts was the information about the water tunnel of Hezekiah. II Kings 20 tells us that Hezekiah dug such a tunnel, but the specifics on how it was accomplished are not in the biblical text. Price and his colleagues (and his daughter) discovered how the 1750s zig-zag tunnel was dug. To gain a very clear understanding of the battle Price has fought over the relevance of archaeological finds to the Bible, read chapters 17 and 18 on the various perspectives the author has encountered in working with other archaeological researchers. It is important for us to know and understand the world’s view of the Bible. To the post-modern thinker, it is just a good story only to be accepted as one sees fit for his own personal advantage. This then becomes the world’s view of such finds that collaborate Scripture. The book also contains an extensive list of the museums where artifacts are displayed. Just as an end note, these books are important reading, but possibly the most clear, concise, and valuable book I have on artifacts from biblical periods is still Dr. Peter Masters’ work, Heritage of Evidence in the British Museum (Wakeman Trust, 2004). Pastor Shrader and I spent an entire day in the Museum with that book. You have the artifacts in view while Masters’ text explains its place in the Bible.